are those pigtails i detect? she is so cute!! there were pigtails. they didn't even last until we got to the car. and yesterday we got a haircut. can you post the "normal" 4x6 picture of this somewhere? this one is clearly cropped and i imagine costco will have issues printing it. thanks! 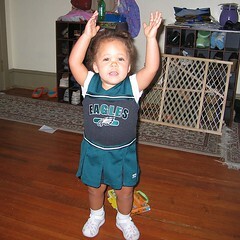 Whatever with the Eagles outfit! Ha Ha! At least she's mastered the touchdown signal! Can't wait to see her.